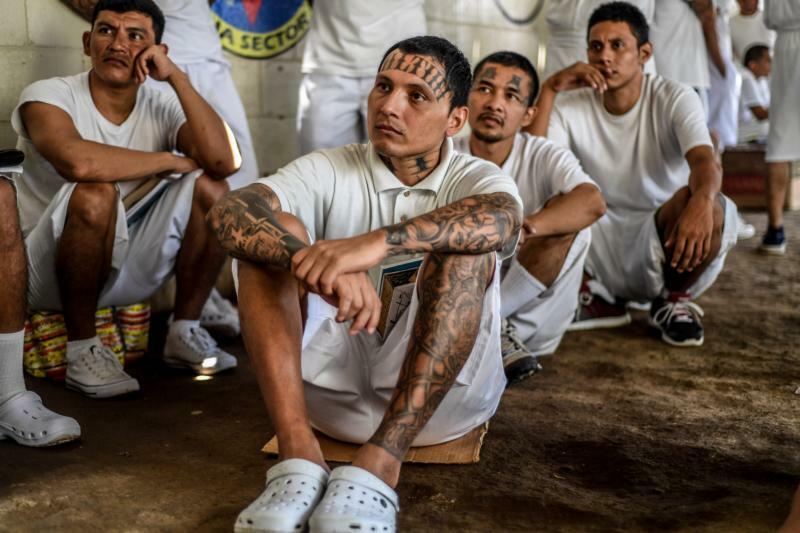 WASHINGTON (CNS) — While researching a video project on gangs in El Salvador in 2015, freelance journalist Danny Gold stopped to talk to a guard who told him how a prison group with little to look forward to had found a positive path forward in life — and it involved religion. Tired of the danger a life inside a gang entailed, even inside prison, some gang members found that there was one way out of the life of crime they had chosen that did not include death. It involved embracing Christianity, particularly the born-again movement, and he set out to document it in the video feature called “The Only Way Out Is Through Jesus.” He shared the making of the video with an audience at Georgetown University Oct. 24. His reporting produced a 12-minute video for The Guardian that includes an examination of how evangelical churches have helped gang members in El Salvador escape a life of crime by becoming born-again Christians, which provides them structure, forgiveness, acceptance, a support system and, for some, redemption for their past lives of crime and violence. “You ask yourself a lot of questions,” Gold told the audience at Georgetown, mainly whether it is possible for people to turn their lives around. Gold explained how the U.S. had been involved over the years in El Salvador, inadvertently creating the conditions that fomented the growth of gangs in the Central American country shortly after the 1980-1992 civil war that was partially funded by the U.S. government. Though gangs in El Salvador existed then at a low level, they expanded with immigration to the north when petty criminals found themselves in jails and prisons in the U.S., learned from incarcerated members of more dangerous gangs in places such as Los Angeles and took back those dangerous lessons to El Salvador when they were deported, Gold said. That resulted in the chaotic and violent situation for present-day El Salvador, which has for decades been reeling from the violence the gangs have unleashed on the poorest in the country, leading many of them to migrate north to escape the violence. El Salvador regularly finds itself on top of a list of most dangerous countries not at war, often trading spots with neighbors Guatemala and Honduras. The three are known as the “Northern Triangle,” and many immigrants from the region head north to escape the conflict. Though Gold focused on the work of evangelical pastors, the Catholic Church, too, has for years been involved in seeking a solution. Organizations such as Catholic Relief Services have focused on prevention methods and employment to break cycles of violence in the country. The Catholic Church in the country also provides prevention and other programs and regularly calls on the government to do something to help. It also has prison ministry programs. Gold said that in the prison, “a lot of these guys get better treatment if they convert” to Christianity, but any signal that they’re moving back into a life of crime can have consequences of having that treatment and a possible future taken away. For many of them, who grew up with few economic opportunities, came from households with absent parents or in poverty-stricken neighborhoods, “the (evangelical) church provides a hierarchy,” and sometimes a ready-made community and support system they may not have had before. “You generally feel that they just wanted a hug,” Gold said. The transition from the gang member to church member is not too far-fetched when you remember that gang-affiliation provided some semblance of belonging that those who joined may not have otherwise had. The born-again movement provides a similar sense of belonging, Gold said. Gold also addressed the current political rhetoric about Salvadoran gangs in the United States that seeks to curb immigration by insinuating dangerous gang members are among those seeking refuge in the country. And the idea that they’re a threat to the general public “is absurd,” Gold said. What’s also difficult, he said, is to get the general public to see those who participated in gangs as people who can be redeemed.